Black dark lenses fancy dress glasses. A slick accessory for 20s Gangster, 50s Rock N Roll and many fun fancy dress themes! Black plastic glasses, with dark black lenses, for a slick look. The glasses measure approximately 5.5”/14cm across to fit most adults/teenagers. 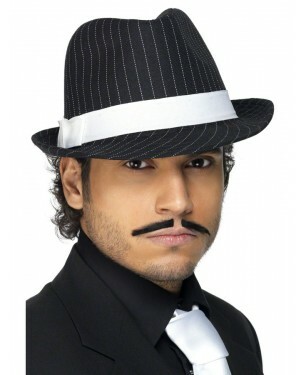 A great finishing touch to many fancy dress costumes includes Gangster, 50s Rock Star, Pimp and many other fun looks! 1 pair of fancy dress glasses. The glasses measure approximately 14cm across and should fit most people.